Have you seen the 12-year-old stand-up comic who seems to have channeled his inner Howard Stern? 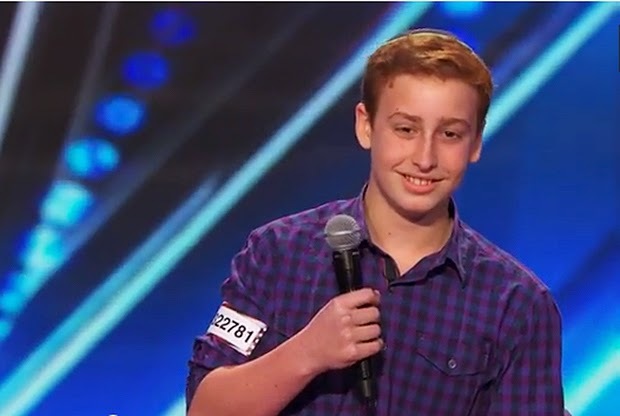 Josh Orlian is a pre-bar mitzvah modern Orthodox kid from New York who told some racy jokes on "America's Got Talent" the other night. His stage presence and delivery need some polishing, but he had Howie Mandel and Howard Stern -- two of the four judges -- in stitches. When I first watched 12-year-old Josh's performance I immediately thought this was a shande far d'goyim (a shame before the non-Jews). Here was this young child (he's not even considered a "man" according to Judaism until his bar mitzvah in September) telling sexually explicit jokes to a national television audience with a kippah on his head. But then I had a flash back to 7th grade when I would bring paperback copies of "Truly Tasteless Jokes" books into class and deliver these racy jokes to my friends during lunchtime. Why is this any different? Sure, it could be argued that Josh's jokes were tasteless enough that he was violating the Jewish ethic of tzniyut (modest behavior), but what came out of Josh's mouth was not anything that's never been heard or alluded to on Prime Time TV in the past. Personally, I've done some stand up comedy in my day and didn't let my kippah or rabbinic title get in the way of being a little edgy (known in the stand up comedy industry as "working blue"). After all, Josh did exactly what he was supposed to do on the show... advance to the next round for succeeding in his craft. He got the judges and the audience to laugh. He made it impossible for the judges not to send him to the next round -- they were shocked, they were laughing and they were impressed. Why was there no question the judges would vote him to the next round? Because both Howie Mandel and Howard Stern saw themselves as pre-teen Jewish boys when they saw Josh Orlian's performance. They became nostalgic for the teen versions of themselves. Both guys were shocking their parents' friends with dirty jokes, profanity and sexually themed humor from a young age. Orlian's performance wasn't the teen version of Andrew Dice Clay. Yes, it was edgier than the teen version of Billy Crystal's youthful Borsht Belt comedy routines, but it wasn't so over-the-top to make us squirm. We were shocked, but not nauseated. It's important that we, the conventional wisdom judges, don't focus on Orlian's yarmulke (I don't believe it's a prop to be used as part of the act). We can't judge him as an overtly Jewish boy telling sexually themed jokes. He's just a normal kid who's developed a skill for telling adult jokes in front of a large audience. And for that we should embrace him and cheer him on. There's enough for us to be ashamed of. This kid's funny and he's got a bright future in comedy. UPDATE: While the four celebrity judges loved Josh Orlian's performance on America's Got Talent, Josh's Orthodox Jewish Day School's head wasn't laughing at all. Westchester Day School's head of school Rabbi Joshua Lookstein sent out a message to the school community, writing in part that "The message conveyed by such a performance was entirely contrary to the Modern Orthodox values taught and lived at WDS. The student and the family have committed to never repeating this kind of comic performance in the future." You are so right! I am so glad that someone from the Jewish community reacted the was you did. Think of Philip Roth and Portnoy's Complaint and so on. I read comments of outrage from my community and am sort of astounded. Your reaction is right on the money. He wasn't at school or at a school function- it is between his family and himself. Butch: Reminds me of 6th grade at Hillel Day School when the head of school admonished our entire grade because a large group of kids went to a movie on a Friday night. The argument was that "you represent the school and its value system -- inside the school or out in the community." I'm not making a case for the way Josh Orlian's school handled his performance on America's Got Talent, just giving another viewpoint. I agree, he was not at school or a school function, and his parents knew what he was doing. But every religious school, regardless of denomination, expects their students to behave a certain way off the school property. I wonder, if he were enrolled at a public school, what the superintendent would say? The act was in poor taste, regardless of his affiliation with traditional Judaism, and if that were my kid, I wouldn't have condoned it. That being said, what is done outside of the school, as long as legal, should not be the business of school officials. I will say that I've noticed a lot of folks within parts of our community who have been concerned with how "our people" look to the outside. I wish that folks would be more concerned with their own actions, rather than wanting to paint a perfect picture of Judaism. Finally, is this boy's stand-up routine any worse than the various cover-ups of inappropriate sexual relations between yeshiva teachers and students? I think not. I don't think the Jewish community should be offended by his performance. The comedy community, on the other hand.. If the school is so offended maybe they should hold up a mirror to themselves. Perhaps they are not as successful at teaching middot as they think they are. I'd be far more concerned that he used his father's joke, than about the jokes raunchiness. Do they actually expect that these kids live under rocks? Neil Zuckerman, I'm surprised by your very negative comment about WDS. Maybe I'm missing something, but I would think that as a rabbi who served in Westchester for many years you would regard WDS as a fine school even if its ideology is different than yours. I read Rabbi Josh Lookstein's full memo to his school community and found it both appropriate and respectful to the boy and his family. I'll forward it if you're interested in reading it. Jews can b funny just like other people. He is a preteen in 2014, seriously... Get a life, relax, enjoy life and stop criticizing your own people. U should respect him and his parents choice. Be proud of your culture, humor and children. Nice job Jason A. Miller for supporting him. He made me laugh. Just like my kids do when they often say, "that's why she says". i think it's absolutely acceptable for the school to react as they did, and i think if you disagree, you don't understand the concept of a religious school. a religious school is essentially a club based on morals that they define for themselves. part of the defining must come, of course, as questionable situations arise. having a say in what your students do both on and off school grounds is something that comes with the territory of a religious school. i think it's perfectly illustrated by the head of the school's quote at the end of the article, where he says that the school "loves" the boy. his parents are paying for exactly that: these familial, community feelings in the school alongside the education that you don't get at a public school. in other words: things that leave the classroom. and now some people are complaining about the aspects that come with that. unfair. the school has an image to maintain; a brand to sell; and the brand that they have chosen to sell is one that finds this behavior in conflict with tzniyut. they didn't do anything wrong. @jennifer kanarek cahn: what you said about the importance of people being more concerned with their own actions, i totally agree with on a personal level. but it is the business of the school officials if they choose to make it so. just one of the many reasons to not send your child to a religious school if you don't want scrutiny on your personal life from others. The school can do whatever it wants, privately. I don't think a public rebuke is absolutely acceptable, though. I suppose it might depend upon whether the school, as part of its admissions process, issues guidelines/rules regarding speech and other conduct that they demand be adhered to by their admitted students even when doing outside activities. If they do issue such rules/guidelines, then I suppose it is fine if they punish an offending student who violates the guidelines/rules that the student has agreed to when enrolling at the school. But if they do not, then I suppose the school can still do whatever it chooses to do, but I question the fairness of what they have done. And in any event I question the wisdom of this kid (but he is only 12) and or/his parents, who publicly do things of this nature while the kid is wearing a kippah. Again, he is free to do whatever he/his parents want, but he needs to know that he may not please everyone when doing so. And there may be consequences. Like being asked to leave the school. Raunchy stand up comic versus yeshiva bocher. Oh, life's choices. My problem with what the school did is, they inserted themselves in to the story. Or, to be more blunt, they now ARE the story -- see the headline. Are they grandstanding? Riding the kids' coattails? So ridiculously naive as to believe their email to all the parents wouldn't be made public? This doesn't come across as a defense of Jewish values, but rather as a tone-deaf power play. Seems to me that issues between a school and an individual student should be addressed privately. i think that, whether or not there were explicit rules made clear before enrollment, by definition when you send your child to a private school it has to do with things in the personal sphere. sending your child to a private school is a very strong choice. you pay for the public school taxes no matter what, yet you decide that it's worth it to you to not utilize what you've already paid for. also, tuitions are so expensive that they usually demand a huge living standard change for the average family. it is a strong choice, and it is very much a personal choice. you are deciding to separate your child by something other than your zip code, and that is big. episodes like this shouldn't come as a surprise then. I'm intrigued by this logic. If I understand correctly, the mere fact of enrollment at a private school gives that private school the de facto right to interfere with your personal life? And to do it publicly? I understand having some control over class functions, or events to which the whole class is invited, e.g., a bar mitzvah. But for personal items? What is their right, especially if it's not explicitly in any contract? And where is the line? Could they publicly rebuke him if he asks a non-Jewish girl out on a date? Or if he comes out as gay? What are the reasonable limits? If I'm reading you correctly, your answer is, "there are none." And while I find that intriguing, I don't agree. I guess we'll have to agree to disagree, then. On both clauses. I went to a private college (sort of like going to a private school, just at a older age). I did not check my constitutional rights at the door. do you really think that, in regard to a case like this, colleges and schools are comparable? In many ways they are not, but in this case in many ways they are. Many colleges are concerned about their reputation. When I was in college, and a student used, for example, a racial epithet in a public but verbal attack on others, that student could (and did) face disciplainary action, such as a suspension or expulsion. Now it is sometimes difficult to determine the motivation of the college. Was it trying to maintain a collegial campus environment, free from public racially motivated discord, or was it trying to enforce the college's sense of political correctness or was it worried about the negative consequences to its own reputation suffered when its students acted outrageously (and it made the newspapers)? Not sure. How explicit had the college been with respect to its own "free speech" policies, especially with respect to incoming admittees, often determined my reaction to these kind of cases. It is true that courts sometimes deprive younger students, in a public school setting, of their right to free speech (such as with dress codes that forbid students from wearing certain t-shirts and the like that have certain expressions on them), but usually the school can get away with this only when the offending conduct is committed on their own grounds during school time. Again, I can see a private school being able to impose its will on its students outside the school setting (such as a catholic school that forbids public statements by its students in favor of abortion, let's say, but only if there is an agreement between the student and the school regarding such conduct entered into upon enrollment. And the school would be wiser to handle their displeasure (and the dicipline) privately. Anyone know if this kid has been expelled? "What are the reasonable limits? If I'm reading you correctly, your answer is, "there are none. Until they reach college." That doesn't work very well for me. maybe they are comparable. but the bottom line is that there is no law to protect this kid from getting expelled or punished by this school, and that says it all. i think the difference in our views comes from the fact that i don't like private schools, and i therefore don't have any good expectations of them. if i believed in them, like you guys do, i would also care about getting them to have views that are similar to mine/argue that they objectively have a duty to do what i believe so that i could still participate in them in good conscience. so, good luck in your good fight. i hope that, if i'm wrong about private schools being unhelpful (which i admit i could be! i'm very young, went to public school and university all my life, and have no kids), you make some progress so that more non-believers will have an easier time of seeing how they're good. Well, my response was to the notion that the school's public rebuke is "100% acceptable." It appears that you have gone from this position to one of legality. I don't know how certain your footing is wrt legality, but to me there is a vast gulf between what is legal and what is acceptable. So long as the school isn't actually threatening expulsion, the legality argument doesn't really interest me (even if they *were* threatening expulsion, it probably wouldn't interest me very much). In my mind, the school tried to dictate terms on acceptable behavior by engaging in behavior that was itself... questionable. That strikes me as hypocrisy. They could have handled the matter privately (or, preferably, they could have let it go). Instead they chose to broadcast their objections, and in so doing made themselves the story. Besides opening themselves up to mockery, they ironically exposed to a new audience the very object of their objection. Not really my idea of what is acceptable. oops, i did change from talking about what is acceptable to what is legal. but i stand by what i said before, that a private school does have a right to reach into personal territories, because of the community nature of a private school. but, now that i think on it more, i do think there are limits--the limits are whatever the majority of families who enroll in the school accept. so i guess if you're in the majority, then you're right. BUT according to that logic, acceptable until proven unacceptable. He probably should not have worn his kippah. Elon Gold is a modern orthodox comedian and when he performs (and he can be very adult) he doesn't wear a kippah. If he hadn't worn the kippah everyone would not be focusing on that aspect. Besides, the kid was a frigging riot!!! Marc, my friend, did not think he was that funny. Sorry. But yes, THE KIPPAH SHOULD HAVE BEEN OFF.